The best-in-class teaching programmes across 6 ESCP Europe Campuses. Totally focused on learning in the workplace with the highest quality e-learning multimedia. HTML5 content available with multi-device access via PCs, tablets, and smartphones. We will train you as a professional, providing you with the best tools for business analysis. In a practical way, learn all the skills required for the management and administration of an internationally-oriented company. Acquire management skills and techniques necessary for communication, management and negotiation in a global setting. What Makes Studying The EMIB Programme At ESCP Europe The Right Choice For You? 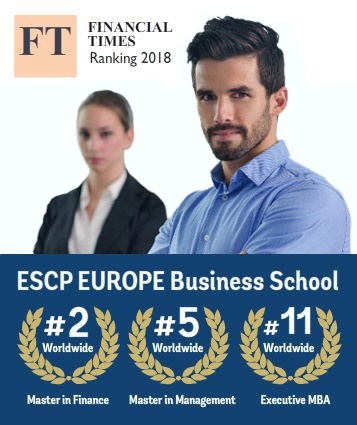 Only 1% of all Business Schools worldwide are triple-accredited, ESCP Europe is one of these, with AACSB, EQUIS and AMBA. Ask for our scholarships. Deferred payment is available. Fees are lower for a Specialist Degree or an Expert Degree. Ask us.